To my knowledge, Arctic H.I.S.S. Drivers were never animated. 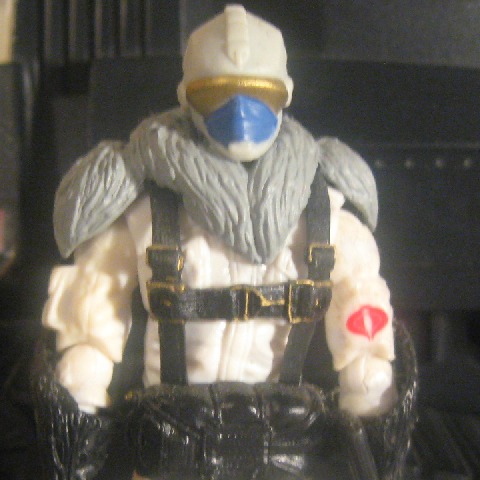 Accessories: black rifle (04 Cobra Trooper's), grey mantle (08 Snow Serpent's), black binoculars (08 Duke's), black Cobra figure stand. ARCTIC H.I.S.S. DRIVERS, like all COBRA H.I.S.S. DRIVERS, are selected from the best of the COBRA infantry forces for their skills, physical strength, and initiative (which means they're some of the nastiest, toughest, and most aggressive troopers in the entire COBRA army). They are given concentrated training in the optimal operation of these powerful armored tanks; then they receive specialized training in cold weather combat and survival techniques. ARCTIC H.I.S.S. DRIVERS are graduates of COBRA Battle School and Advanced Weapons Systems Training. "The only thing colder than the environments in which we live and fight is the ice in our veins." Toy Notes: Sold as an online exclusive to avoid competing with movie-related merchandise on store shelves. Boxed with a recolor of the Cobra H.I.S.S.. Item #37453.